Lona Manning’s excellent variation on Mansfield Park (“A Contrary Wind”) popped up on my Kindle while on summer holiday last year. The word that kept crossing my mind as I read was “authenticity”…of style, wording, and structure. I’m delighted a sequel is on its way. I’ve always been fascinated by how people “create,” whether words, stories, images or music. So I asked Lona if she would answer a few questions on her writing and affinity for Jane Austen’s works. 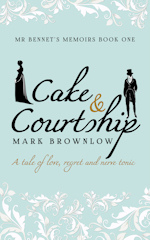 This is the first in a planned series of quick interviews with interesting people from the Austenesque world. Q: You’re probably tired of answering this question, but why Mansfield Park? One thing for sure, I didn’t choose “Mansfield Park” with an eye to cashing in on the huge audience of Fanny Price fans out there! It would be more accurate to say that “Mansfield Park” chose me. The story started writing itself in my head. MP is the Austen novel I re-read the most, even though, in common with most people, Fanny isn’t my favourite Austen heroine. But I love the prose, the story-telling, and way that Austen depicts the characters and their relationships. Q: The Austenesque fiction world is dominated by “Pride and Prejudice” variations, but do you see that changing at all? No, I don’t think so, because Darcy and Elizabeth are such an entrancing couple, and I think re-living and re-imagining that romance is what draws most readers to Austenesque fiction. Which again, I never took into consideration with “A Contrary Wind” because Fanny doesn’t get married at the end of the book! 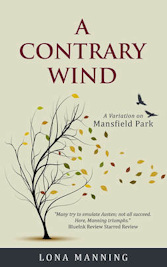 Q: What stood out for me when reading “A Contrary Wind” was the astonishingly authentic feel to the language. Is that something that comes naturally to you, or is there more to it than that? Thanks Mark. I’ve always loved 18th century language, the rhythms of the sentences are so very beautiful, so civilized. And I think I am a pretty good mimic, so it comes naturally in that sense, but while doing my re-writes, I consciously add some of the literary techniques Jane Austen used, like litotes, (instead of saying “An egg boiled very soft is wholesome,” Emma’s father says, “An egg boiled very soft is not unwholesome”); understatement, and language like this from “Sense & Sensibility”: “Do not, my dearest Elinor, let your kindness defend what I know your judgment must censure.” That is called a Johnsonian sentence or Johnsonian cadence, after Dr. Samuel Johnson, who tended to write with that kind of formality, balance and rhythm. Austen also used triplets a lot, such as in this description of Fanny: “timid, anxious, doubting as she was…”. And of course, there are run-on sentences—like my third sentence in this paragraph—and when you come to look at it, Austen used a lot of dashes—quite a few. And she unhesitatingly used adverbs! Q: The novel introduces a thread related to the anti-slavery movement. What role does research play in your writing process and how important is historical accuracy and depth to you as a writer (and reader)? I love doing research, and reading about some little-known story from the past really fires my imagination. One of my favourite authors, George MacDonald Fraser, puts his fictional character Flashman into the middle of all sorts of situations, like the Crimea, and Little Big Horn, and I’ve tried to emulate that. So I swept aside a real lieutenant and replaced him with Lieutenant William Price on the deck of the HMS Solebay, sailing to Africa to catch the slave ships. However, we writers who love historical detail have to guard against adding stuff just for the sake of adding it, of showing off some tidbit we learned. The detail has to serve the story, not weigh it down. I like knowing that what I am reading is historically accurate but I don’t like clunky exposition. Exposition is the tricky part. As the writer Hilary Mantel points out, the courtiers in King Henry’s court wouldn’t have said, “Why masters, here comes the Lady Anne Boleyn, she who has supplanted the Spanish Queen Katherine in the fickle affections of our sovereign, King Henry the Eighth,” because everybody at court already knows it! My mom gave me a copy of “Pride & Prejudice” when I was young. And before the famous 1995 mini-series, there was another one back in 1980 which really got me hooked! Mansfield Park. Maybe I’m a contrarian. Q: Favourite Austen quote (from a book or letter)? Q: Other literary inspirations and favourite authors? As a kid I lived in Narnia. I don’t like much modern fiction. I’d rather read Sir Walter Scott or Stephen Crane than John Updike or Hemingway. I love George MacDonald Fraser. Hilary Mantel is a goddess of prose. I should develop some rituals, that would be cool. Like always wearing a knitted cap, or something. I prefer to be in my pajamas, with a cup of coffee on hand.